The Rajapaksas believe that they have to be in absolute control of the entire gamut of Sri Lankan life be it associated with wealth, power or even sports. They will in this quest spare no pains in maintaining the status quo being afraid of losing any part of it. In shear desperation, they will resort to any tactic to ensure this at any cost for if they lose their hold on power, as to where they will end up is anybody's guess. ( August 18, 2013, Colombo, Sri Lanka Guardian) Was the Human Rights Code meant to be observed by the most disciplined army only in the massacre of the Tamil civilians in a war which Mahinda Rajapaksa referred to as an humanitarian operation purported to be fought against a group of "international terrorists"? The question also is whether the recent wanton killings of the three innocent persons including two school going youth who had happened to be in the legitimately peaceful protest in the quest of drinking water the most basic of human needs, also an humanitarian operation. Whether it is 3 or 40,000 killed, what matters is the scale of the intensity of the anguish and the helplessness suffered by those near and dear both at the micro and the macro levels. The near relatives of those recently killed might not have the clout, the wealth and the power but they were as precious to their near relatives as would have been to those in positions of power and wealth if they had lost their relatives under similar circumstances. Whether it is the Sinhalese protesters in small numbers or Tamil civilians wantonly killed in their tens of thousands the simple fact is that their grieving relatives can in no way be adequately recompensed for their loss by the holding of farcical Presidential commissions nor by the payment of sums of money from the state coffers. We are in no way trying to make a point on behalf of the tens of thousands of Tamil civilians who perished by exploiting the recent calamity of those Sinhalese persons who had lost their near relatives. Using the words of MA Sumanthiran MP, we are "united in grief". It has been noted with alarming concern that in recent times that even when there was a semblance of a peaceful protest or dissent the army had been called in to put it down as was also done in the shooting down of Roshan Shanaka in May 2011, the fisherman in Anthony Fernando in February 2012 for taking part in a peaceful protest against the increase of fuel. Then there was the case of the 27 deaths caused by the army in the protests at Sri Lanka's principal jail in Welikada. The army was also used to brutally quell the peaceful demonstration organised by the students at the Jaffna University. The army first came to be used extensively during the 1971 insurgency when more than ten thousand Sinhalese youth were killed also by the carpet bombings of JVP strongholds. Even in the state sponsored Pogroms engineered against the Tamil people in 1979, 1981 and 1983 the army was deployed in the attacks against the Tamils with no provocation but purely on account of their being Tamils. It is an oft repeated canard that the Sri Lankan army is the most disciplined while in fact they are the most ill-disciplined and barbaric as their actions both at home and abroad would evince. It is important to reflect that during the height of the war in May 2009, the Sri Lankan military could not have won the war against the Tamil militants without the massacre of the tens of thousands of civilian men, women, children, the infirm and the old through blanket aerial bombardments, attacks on hospitals and attacks of the so called no fire zones where innocent persons were unwittingly lured into. In the past although there were sporadic bombings of civilian targets under JR Jayewardene, Presidents Premadasa, Wijetunge and Chandrika Bandaranaike did not venture to bomb Tamil civilian targets like their settlements, hospitals and schools although there had been instances of severe embargos on essential food and medicines under Chandika Bandaranaike. However, it was during the Rajapaksa regime that the frenzied antagonism against the Tamil people took shape. It would be recalled that during the war, the Gobelsian doctrine that "anything was fair in war" was revived by no less a person than the secretary for defence Gotabhaya the President's brother. Again we have the instance of the minister Vimal Weerawansa while on a reconnaissance flight on a helicopter along with an army higher up in the north had said that a bomb be dropped and when in response he was reminded that tens of thousands of people would be wiped out, Weerawansa is said to have replied that it did not matter as they were all para themalas (lowly Tamils, the Sinhala chauvinist perception of the Tamils). Given the kind of army it is, for the Rajapaksa regime, it has become convenient to use it to nip any protest or dissent in the bud with brutal force. It is akin to wearing a bullet proof vest for a pea fight. It has become very easy to turn the focus of the army that had been engaged in the atrocities in the north against the Tamils towards the Sinhalese people in the south. In Weliwiraya, though the massacre was confined to a small area namely the catholic church it is very revealing what a soldier threatening a nun who was trying to shield a parishioner from harm being told that she would face the same fate as what the Tamils did. It is becoming increasingly evident that anything done in the form of a peaceful protest even in the Sinhalese areas, is deemed to be a declaration of war against the State and an affront against the Rajapaksas who consider themselves the State and hence the perceived need to quell it with an iron hand. 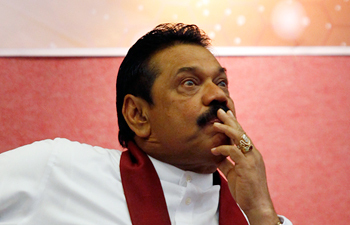 The Rajapaksas believe that they have to be in absolute control of the entire gamut of Sri Lankan life be it associated with wealth, power or even sports. They will in this quest spare no pains in maintaining the status quo being afraid of losing any part of it. In shear desperation, they will resort to any tactic to ensure this at any cost for if they lose their hold on power, as to where they will end up is anybody's guess. Quite unprovoked, Gotabhaya lost no time in nervously referring to the Weliweriya incident, commenting that their antagonists were trying to tarnish the image of the army in justifying the allegations of war crimes. In regard to Weliweriya they are busy eating humble pie. We believe that there would be many more to come.